This is intriguing stuff, is it not? It is throwster’s waste, leftover from commercial silk processing. 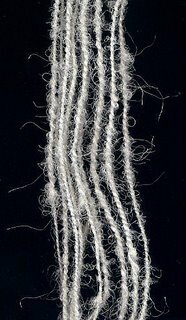 The technical jargon for reeling silk from cocoons is “throwing,” where the silk fibers from many cocoons are reeled together with twist added to prepare them for weaving. However, there is some waste to that process, and this is it! I had a total of about 29 grams of throwster’s waste in my silk pack, so I decided to try a couple of things with it. It was already degummed, so I could start experimenting with it right away. First, I wanted to try and spin some of it by the handful, like I do curly kid mohair yarn. The result wasn’t very curly of course, more like a bulky eyelash type yarn, especially after it was plied back on itself. 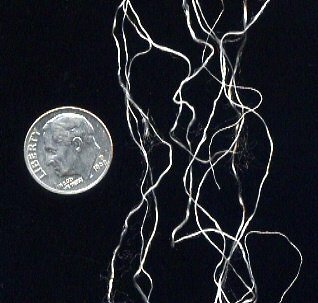 * The length of the fibers - after every couple of yards or so the fibers would begin to tangle on themselves. This didn't make it impossible to spin this way, just slow. Next time I would cut it into more manageable pieces. * Keeping the yarn consistent. This would resolve itself with practice. 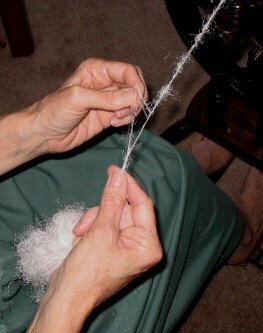 I would have liked to have plied the single with silk thread, but had several “bare” spots that I didn’t like. The rest of my throwster’s waste will find it’s way into the dyepot in preparation for a different yarn. What interesting work you're doing! I love the tie; it turned out beautifully!